Shari Thuyns (19, 1.78m, Luxembourg City) was crowned Miss Luxembourg 2010 at the conclusion of an event held at the Château d'Urspelt in Urspelt with the participation of 10 contestants. She will represent Luxembourg at Miss World 2010 in Vietnam. First runner-up is Laura Lazic and the second runner-up is Carole Brucher. On the same event 30 year-old Carlo Marino from Luxembourg City won the Mister Luxembourg 2010 title and will represent Luxembourg at Mr World 2010 in Seoul, Korea. First runner-up is Jean-Paul Theisen and the second runner-up is Steve Pinto da Silva. Ivaniltan de Fátima Lorenço Paulo Jones, from the province of Zaire, received the title of Miss Angola Mundo 2010 after finishing 2nd place at the Miss Angola finals celebrated on December 10. She will represent Angola in Miss World 2010 in Vietnam. Nicole Flint; 21, 1.72m, from Pretoria; was crowned Miss South Africa 2010 at the Superbowl in Sun City. She will represent South Africa in Miss World 2010 in Vietnam. First runner-up is Matapa Maila and second runner-up is Lisa van Zyl. Hiroko Matsunaga; 18, 1.71m, from Fukuoka; was crowned Miss World Japan 2010 on December 13. She will represent Japan in Miss World 2010 in Vietnam. Malika Ménard; 22, 1.76, from Caen; won the Miss France 2010 title on December 5th in Nice. She will represent France in Miss World 2010 in Vietnam. 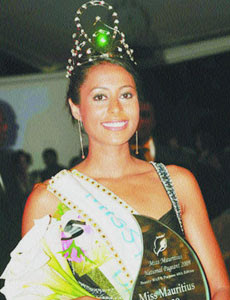 Dalysha Doorga, 22, was crowned Miss Mauritius 2009 on October 24 at the Movenpick Report and Spa. She will represent Mauritius in Miss World 2010 in Vietnam. Joceline Fortes, a 22 year-old communications student from Sao Vicente, was crowned Miss Cabo Verde 2009 at the National Auditorium. 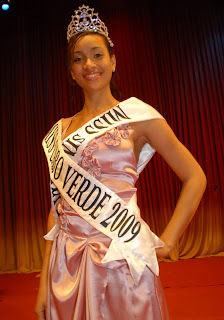 She will represent Cape Verde in Miss World 2010. First runner-up is Elizabete Barradas and second runner-up is Francisca Correia. The representative from Gibraltar, Kaiane Aldorino, is the 59th Miss World. She was crowned at the conclusion of an event celebrated at the Gallagher Convention Centre in Johannesburg, South Africa. A record-breaking 112 contestants competed at the event marking the biggest turnout of delegates in the pageant's history. Mexico's Perla Beltran was the first runner-up and Tatum Keshwar from South Africa was the second runner-up. And so it ends... certainly it was a pleasure covering the Miss World 2009 for this past year bringing you exclusive news and details from the national preliminaries. I do hope that you all enjoyed the coverage. Special thanks to my collaborator Nicole Giobbe for your fantastic contributions and to all visitors for supporting World of Misses. We will on a break until January when we start the 2010 coverage. Puerto Rico: Puerto Rico Network, E! As the final day approaches, Miss Puerto Rico leads all 21 betting houses followed by World of Misses. In second place is Mexico and in third Barbados. 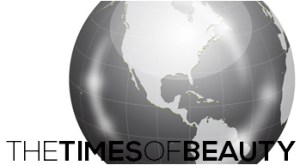 South Africa and France are also in the Top 5, with Jamaica and Belgium in several agencies. Puerto Rico leads the betting houses since October 28. Final update on Friday. Check out the Top 5 of each agency! The 112 Miss World 2009 contestants visited the Legends Entabeni Safari Conservancy in Limpopo where they experienced the ultimate African safari adventure. They were greeted by locals and had the chance of exploring the diverse flora and fauna of the area. The contestants currently are in the city of Cape Town in western South Africa, the last stop before heading back to Johannesburg for the Miss World finals.